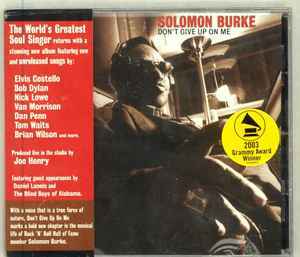 Solomon Burke is considered as one of the founding fathers of the soul. He combined early pop, gospel and rhythm and blues & his record from the 1960s are among the best in the genre. Despite a series of successful r&b-hits broke Burke never really widely by, he left show business eventually becoming a successful priest and funeral service. In addition, this busy owner for years had held two independent record labels, where he founded his own record on. For this special cd label Fat Possum approached a number of renowned songwriters with request to deliver material. Big names like Elvis Costello, Tom Waits, Bob Dylan and Brian Wilson hapten right away. The result is a stunning deep soul ' plate. Burke sings the strong song material with the same strength and intensity as in his younger years. It makes Don't Give Up On Me a real must for anyone who wants to know where contemporary artists from the r&b and new classic soul the mustard.